Newspapers differ on Gandhi’s big announcement. Economic Times ignores it but for a box item on page 1 – and cheekily places it next to a report on “Extreme poverty falling at fast pace under Modi” on page 2. However it does comment on it (Read Opinion). Business Standard pushes it to the anchor slot. Hindustan Times calls it his “big poll promise” — he is “preemptively staking claim” to a welfare scheme that the Bharatiya Janata Party (BJP) might announce in its Union Budget. 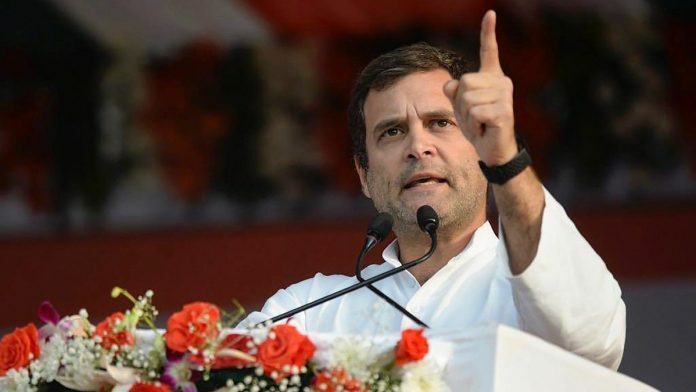 The Times of India is less impressed in “Rahul ups populist ante, vows minimum income for the poor.” Without mincing words, TOI calls it “latest populist gambit to woo voters” after its loan waiver move in Madhya Pradesh, Chhattisgarh and Rajasthan. TOI leads with a PIL demanding that shlokas in Kendriya Vidyalayas no longer be mandatory to recite, since it is derived from Hindu scriptures and “violates” the right to religion of minority communities. This is “setting the stage for a legal battle which could be an extension of the ‘culture war’ being waged in the public arena,” observes TOI. Express alone covers Kapil Sibal’s claims that the “Govt shutting off channel I financed” (page 2). “‘I’m talking about how dissent is stifled, how people are not allowed to speak,”’ he said at the Jaipur Lit Fest. The Economic Times is the only paper to comment on Rahul Gandhi’s minimum wage promise. In “Not by breaking the Bank, Rahul Gandhi,” it asks if the move is a “bleeding heart commitment of a neophyte,” “hard headed politics,” or “fiscally profligate populism?” “One blurs into the other,” ET writes in answer to its own question. In Express, C. Raja Mohan, director, Institute of South Asian Studies, National University of Singapore, raises doubts over US-Taliban talks in “An Afghan Trifeca,” primarily because “not many will vouch for Taliban’s trustworthiness.” On Pakistan, Mohan wonders if it really “wants peace”. Mohan warns that for all the positive signs, “if you are a sceptic” getting the US, Pakistan and Taliban to abide by their promises “is near impossible”. News18 network boasts big today with full page 1 advertisements in TOI, ET and HT, claiming its “India’s No.1 News Network” with 16 channels. It doesn’t claim to have “India’s No.1 channel”, though. Rahul Gandhi’s “gamechanger” pitch for MIG received coverage through Monday afternoon and into the prime time belt. Former finance minister P. Chidambaram was the most sought-after guest. He achieved the remarkable feat of appearing on three channels, simultaneously: ET Now, CNBC TV18 and India Ahead. Since the exact amount that Congress will offer is still unclear, the TV discussions were speculative. The channel’s consulting editor Swaminathan Aiyar replied, “Universal Basic Income is wrong.” If the amount is “Rs 1,000 per household per year… this is not what you call income,” he argued. Shrinate asked Chidambaram how, as a former minister who was mindful of financial rectitude, would he square a minimum income with prudent fiscal policy? Monday night, NDTV India and Republic TV were more concerned about former Karnataka CM Siddaramaiah’s rude behavior towards a woman. TV news played video footage of Siddaramaiah at a function Monday in a wordy duel with a woman. He’s seen snatching the microphone from her, dislodging her dupatta. Republic TV’s Arnab Goswami asked if his actions were accidental or deliberate? Ravish Kumar of NDTV India had no doubt: he criticised Siddaramaiah for bullying the woman.